E-Track Ratchet Tie Down Straps for used to enclose trailers, cargo vans or interior haulers. Made with our 12,000 lbs. 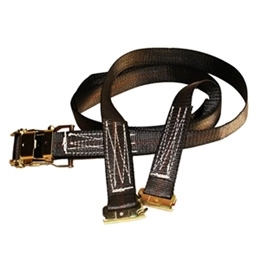 Rugged Weave material, these tie down straps are abrasion resistant and protect against UV rays, dirt, oil, and water. Spring loaded, these E-Track Straps are easy to connect and disconnect, and are commonly used for securing loads inside of trailers or vans that are fitted with inside rails and/or floor connections. Fitted with 3,000 lbs. breaking strength! Multiple lengths available.